Every year on National Dump the Pump Day, motorists are encouraged to save money at the gas pump by taking public transit instead of driving. A two-person household that downsizes to one car can save ─ on the average ─ more than $10,174 a year, according to the American Public Transportation Association. You can figure out how much money you could save by taking Metro by using our fuel savings calculator. This year, National Dump the Pump Day is scheduled for June 19, and in conjunction with the annual event, we are having a photo contest so you can show us and tell us how you are saving money on gasoline by taking Metro transit. Here’s what you need to do to enter the contest. Today through June 16, take a photo and post your photo on Instagram. Follow us @STLMetro on Instagram. Take a photo and let us know how use Metro transit to help you live, work and play. Post your photo on your Instagram (make sure your profile is public). 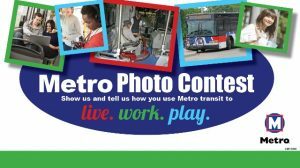 Post your photos on Instagram between today and June 16 with the correct hashtag and write somewhere in the caption (in all caps) if your photo represents how you use Metro transit to LIVE, WORK, or PLAY. Photos tagged correctly will be posted on our Facebook page for everyone to review and like. The voting period for the contest will run from today through June 18. One winner will be announced for each of the three categories on June 19, Dump the Pump Day. Winners will be determined by the highest number of Facebook likes each photo receives only on our Facebook page. The three winners will each receive two Cardinals tickets for an upcoming game.